Your agency is exploring solutions to help you track, manage and automate more aspects of the FOI function so that you can focus on higher value activities. GLiNTECH has developed a packaged automation solution called Dash that helps Victorian government agencies track, manage, process and report on requests for information received under the Freedom of Information Act 1982 (Vic) and other legislation. It offers users advanced workflow management, document automation, email reminders, reporting functionality and other features. Processing FOI requests often involves managing multiple deadlines and time frames prescribed under the FOI Act Act. Dash automatically calculates due dates prescribed under the FOI Act for each sub-tasks and allows different end users to track, manage and process interrelated sub-tasks, independently. Never worry about when you need to issue a decision, advance deposit request or consultation letter again. 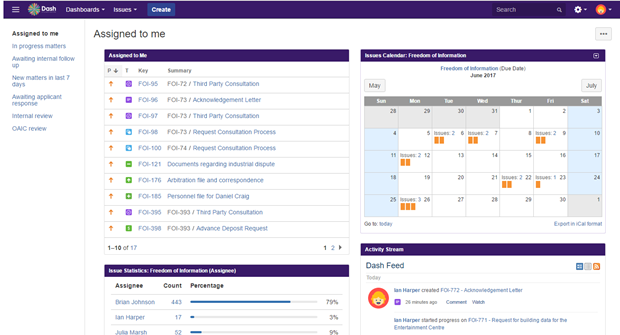 Display real time data on outstanding FOI requests using fully customisable dashboards. 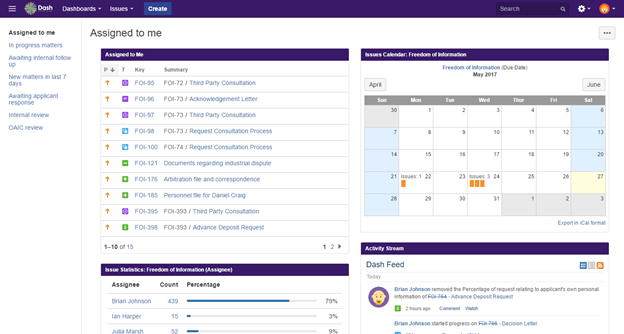 Individual users can track what matters to them, their team and your stakeholders, live, all in one place. Don't waste time trawling through your FOI inbox or MS Outlook calendar everyday to figure out where a request is at in its lifecyle and what needs to be actioned. Issue Statistics show you how much work your team members are doing and help you manage team utilisation and resource planning. 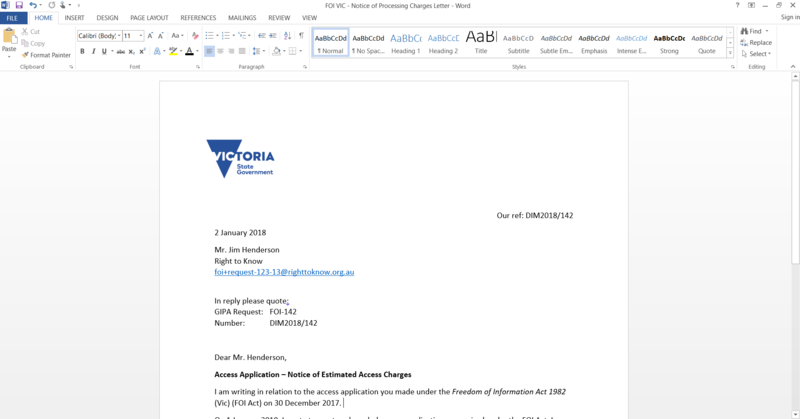 Enter information about the FOI request once and use it to populate standard responses, including acknowledgement letters, advance deposit requests and access decision letters to reduce the time spent processing FOI requests. Document automation helps your team eliminate inefficiencies, improve compliance, and save time on drafting. FOI requests lodged with an agency by e-mail can automatically generate tasks in Dash which can be triaged and assigned to the relevant assignees within the agency. Assigning tasks is simple and allows agencies to track outstanding tasks to help ensure that external and internal deadlines are met. Having a short triage list ensures that FOI requests don't fall through the cracks, causing you to miss a statutory deadline. 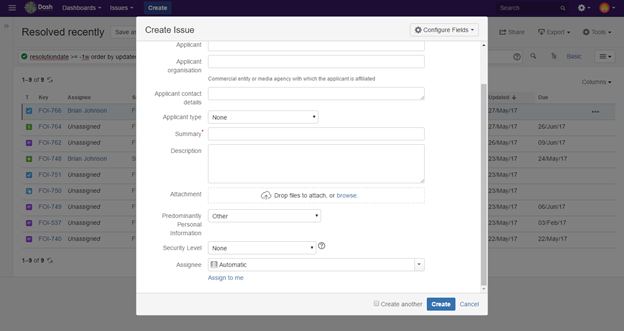 Assign specific access permissions for each FOI request to ensure that sensitive requests can only be viewed by end users with the appropriate authority and permission. Never worry about the wrong people stumbling onto sensitive requests like those relating to former or current staff complaints again. 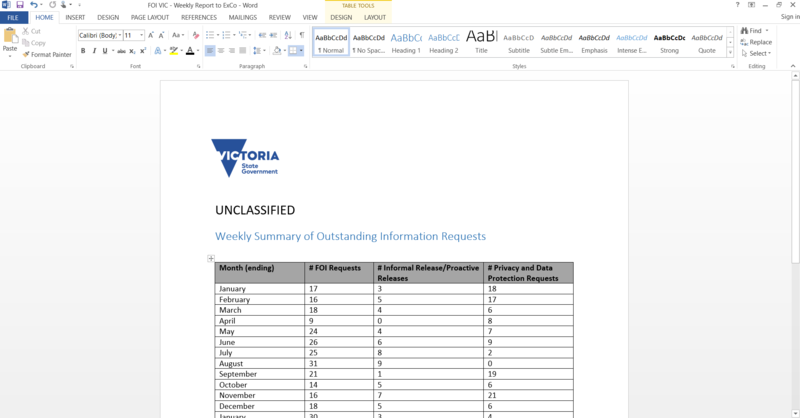 Export data about freedom of information requests to help respond to the annual survey issued by the Victorian Information Commissioner. 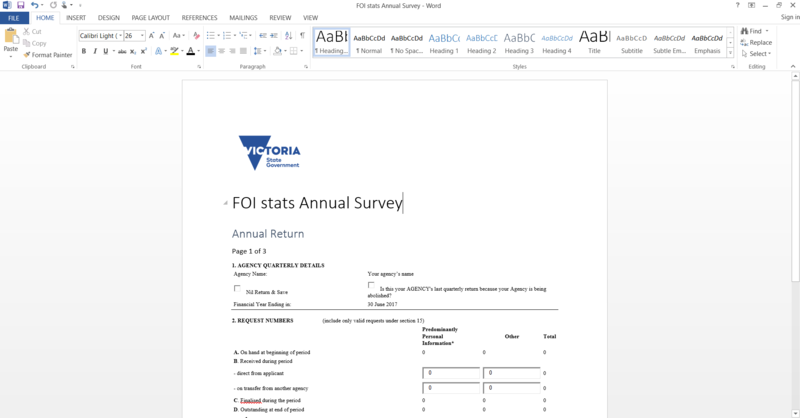 Whilst MS Excel is great for some things, it's not great for completing your annual survey, lacking audit trails and capabilities to cross check your figures. The reports you produce using our solution allow you to quickly link back to each FOI request through a click of a button, allowing you to see which exemptions were considered and more. 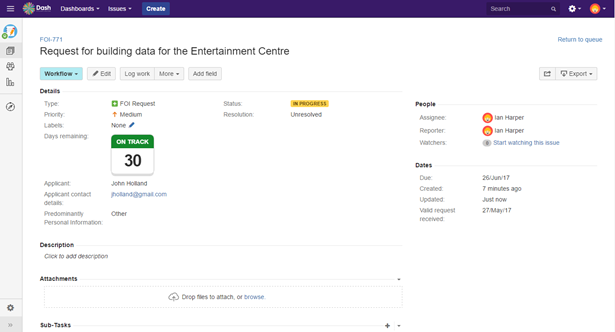 Generate customisable internal reports for senior stakeholders. Never worry about receiving unusual requests for FOI data at short notice again. Our solution will let you easily search for anything and everything related to FOI requests with a few clicks. With an open API, users can also generate other internal reports using third party products such as Tableau. A dynamic issues calendar allows end users to effectively identify upcoming due dates, providing enhanced visibility for information access teams who receive and process a high number of FOI requests. Identify bottlenecks and resourcing constraints early so that you don't get overstretched with too many deadlines falling due at the same time. Upload all of your files into one place for ease of searching and use. Using our solution, users can upload multiple file types, including Microsoft Word, Excel, PowerPoint, Outlook files and PDFs, whose contents can then be searched using advanced search queries. Don't waste time navigating through shared drives, emails and other document repositories again.